A group of women wearing short dresses got out of their car. The car’s tire had sunk in the sand, and refused to move. Some men surrounded them, giving them smiles and offering their help to the girls. Their own car had got sunk in the sand, but they hardly paid any attention to it or the “Tree of Life”, now that they had something else better to look at …… . I gazed at the tree from a distance. 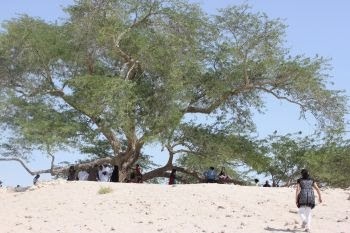 This ancient tree was called the “Tree of life” as it had survived in the desert for 400 years without any known water source. When we were just about to reach, I had seen a tree next to the roadside but it was only my size and I had felt disgusted, since I thought that was the great ‘Tree of life’. But when the real tree appeared in sight, bigger than its imposter, my disgust turned into wonder and amazement. Many people, the newborn, the middle-aged and the old, were sitting on the tree happily and trying to climb it. Some branches of the tree touched the ground while the others were high. Everyone was chattering non-stop and taking photos. After we saw the tree, as we walked back to our car, the girls were still there, now looking a little impatient. The men were pushing their sleeves past their elbows and were hard at work. Seeing the girl’s impatient look just made them work faster. Finally the tire was out, the girls squealed, and the men hurried off, to start working on their own car in the hot sun.